See Pro Pilots at the SAC Helicopter Fun Fly! « Big Squid RC – RC Car and Truck News, Reviews, Videos, and More! So I spoke very highly of my trip to Indiana for the IRCHA Jamboree last month, probably enough to make you curious as to what do you see when professional RC helicopter pilots take to the sky! For all you midwest/Chicago metropolitan area RC enthusiasts, the Surburban Aeroclub of Chicago is hosting their annual Helicopter Fun Fly this Saturday. This year they have a list of pro pilots making appearances to meet everyone and show off their skills, including Mitch Marozas and the others listed on the above flyer! I met most of these pilots at IRCHA, and can’t wait to see them again. 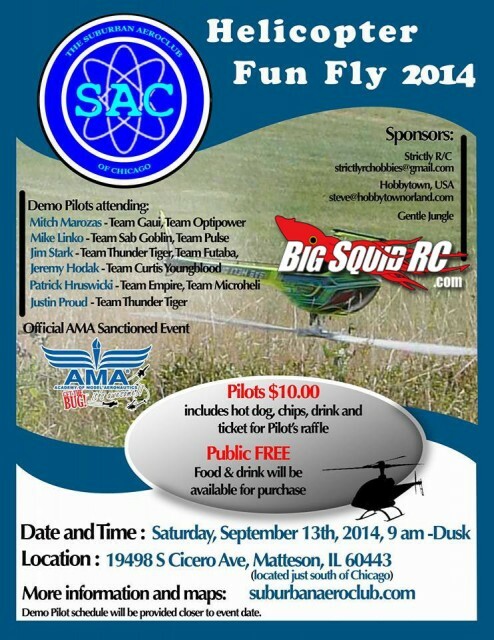 This is a free to spectate event, and AMA helicopter pilots can join in the fun for $10. I will be there representing Raging Rotors as well as being a team pilot for HobbyTown Orland Park (aka I’ll be working and flying). I will be flying my 350QX, 200QX, and more! Stop by the HobbyTown table and say hi! Until next time, Stay Shiny and Keep Flyin’!